← Denison Street – more traffic, bigger port, new residential developments and green space reduced. Could the NSW EPA run a simpler system for reporting industrial pollution. A system that encourages people to snap and send rather than be responsible for identifying the source of pollution and referring it to the polluter (see below). Shouldn’t the EPA want to know the extent of industrial pollution being observed? Shouldn’t it want to engage with the public – referred to as its ‘eyes and ears’ – and assure them. This thick black smoke at peak hour on a Monday morning was not observed in some gasfield, but only 10km from the centre of Australia’s largest city. The photo of this flare was taken at around 8.35am on the 21st May, 2018, and uploaded soon after to twitter, with the EPA tagged. 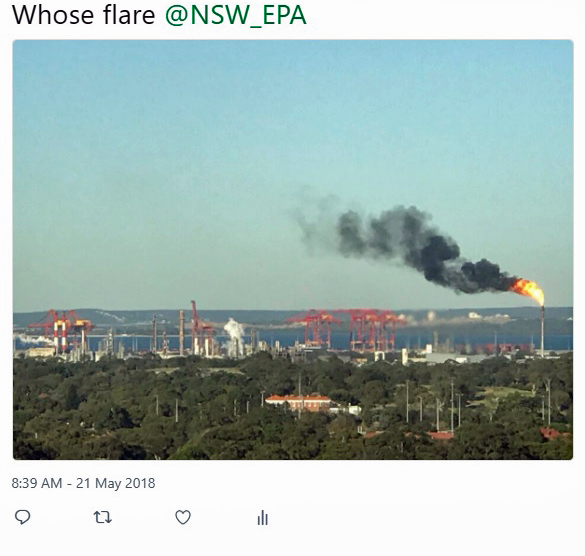 There was no answer from the EPA and the question of ‘whose flare’ was asked again on 25th May with the Minister, Gabrielle Upton also tagged. Again no answer. The photo was then sent by email to the EPA environment line – info@environment.nsw.gov.au on 27th May. Modelling of past flaring events indicates that this flaring is unlikely to have had any significant adverse impact on human health or the environment. There was no ‘thank you for reporting this’, more a tone of ‘nothing to see here’. Thick black smoke is a reason for alarm as evidenced by an event at Qenos in 2016 – and a larger one in 2010 when 14 fire trucks were sent to 7 different locations. Flaring is worth discussing not only because of the pollutants, especially particulates, and greenhouse emissions but because of the perceived threat. If you are emailing to report an urgent pollution incident, please call 131 555 (press option 1). Please note that in sending us an email, we will record your email address for the purpose of responding to your enquiry. If your email requires a transaction or another more detailed service, we may record the personal details you supply, or request further details from you in order to provide the service you have requested. Where this is not necessary you can request your details remain anonymous or confidential. Details of our Privacy information can be found on the website at www.environment.nsw.gov.au/whoweare/privacy.htm. Reply same day: Dear xxxx, did you look at the photograph I sent? Qenos activated an elevated flare at its licensed premises at Botany Industrial Park between 8:30 and 9:30am on Monday 21 May 2018. The elevated flare was activated as a safety measure following a boiler shutdown and loss of steam at the premises. Intermittent smoke from the flare was visible between 8:35 and 8:42am. Qenos notified the EPA of the flaring in accordance with the requirements of Environment Protection Licence 10000 and has undertaken an investigation into the cause of the steam loss and provided information to the EPA. If you have any further questions in relation to this event please contact me as below. Note as many details of the incident as possible, including time, date, location, descriptions of the people involved, vehicles and number plates and anything else noticed. This entry was posted in Uncategorized and tagged Air Pollution, EPA, Qenos. Bookmark the permalink.